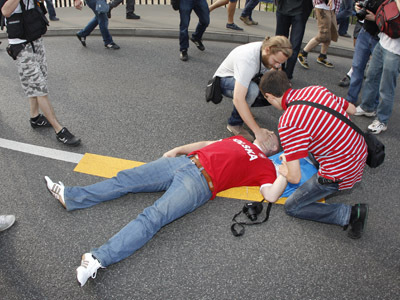 Just days after unprecedented clashes between Polish and Russian fans resulting in numerous arrests, the Russian Euro 2012 contingent in Warsaw is soon expected to double. Amid security concerns, Polish authorities are trying to appease the guests. More than 20,000 Russian fans are to arrive in Warsaw with tickets for their team's crucial Group A match against Greece on Saturday – twice the number that showed up for the game versus Poland. 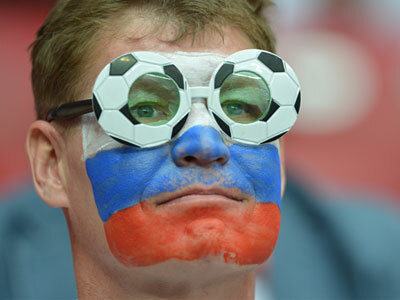 If Arshavin and Co. claim the first spot in their quartet, the permanently-increasing army of Russian supporters will remain in the Polish capital until at least June 21. So an unquiet week is up for one of the Euro 2012 co-hosts. The country’s security services pledge readiness for any kind of provocations. "The security arrangements [at the Saturday match] will be adequate for the risks," Reuters quotes Interior Minister Jacek Cichocki as saying. Meanwhile, fourteen Polish hooligans have been convicted in fast-track trials for their role in Thursday’s violent clashes. Seven were convicted Wednesday and seven others Thursday. Two people received prison sentences of various lengths while others got suspended sentences. They were found guilty of assaulting police officers and “taking part in illegal gatherings.” According to the country’s laws, street gatherings are considered illegal when participants join them with an obvious intent to be violent. Most of the 24 detained Russians have been released without indictment.